Mike Strantz was one of the real artistic young architects out there. His tutelage under Tom Fazio gave him a real penchant for dramatic design. He built courses with enormous visual appeal and drama with so many memorable holes that the term “Signature Hole” seems to be frivolous when looking at one of his designs. His approach to designing golf courses was to walk the ground with his pastels and his sketch pad and draw the holes as he envisioned them. In spite of the nouveau look of his courses, he had a very old school philosophy about shot values and strategic design. This course is like Royal New Kent on steroids-the challenges are daunting-often layered on top of each other for extra effect-very much in the Irish tradition of a good mix of strategic and quirky holes. You will not walk off this course with anything less than awe for the vision and effort it took to create it. If you keep your wits about you it becomes apparent that every hole has a safe way to play and scoring well here is a matter of carefully choosing which challenges to take on and which to ignore. The par five first hole is a perfect example of this-he presents you with a series of pumped up challenges you just need to ignore. There is a conservative three shot sequence that needs to be heeded or else you can start off your day with a very bad number. 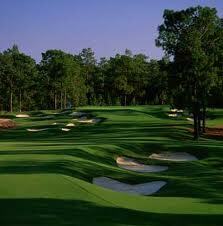 All the par 5’s are three shot holes to all except the testosterone junkies. The vast waste areas on these holes bait you to go for what appears reachable in two. The overall yardage is not overwelming but the 71 par makes that a bit of an understatement. The par 3’s are all very short so there is extra yardage available to the four pars and he uses it. Landing and layup areas throughout the course are much more generous than they appear to the eye-he has used the waste areas and adjacent mounding to mask the true depth of these areas. You will continually be saying to yourself after your reach your ball- “wow, there is much more to shoot at than it looked from back there”. Good design. There are quirky holes out here-especially the three pars. Many will call these holes tricked up or unfair but neither of those terms has a place in the Irish golf realm from whence they come. You simply have to pick a target on the short holes and don’t let the extraneous visual elements get into your head. These are really the holes to stack your card with pars so be disciplined and play for the fat of the these greens. 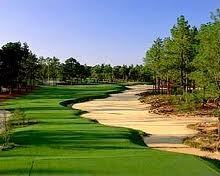 As with most courses across the pond, this is a course you have to play without scoring expectation. Play a match with your friends and forget the medal score. You can win some money and maybe, just maybe, still be pleasantly surprised when you tally your score at the end how well you fared. 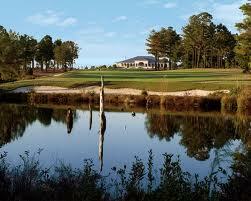 This is a real Donald Ross gem built in 1926 as the sister to Mid-Pines that opened about 5 years earlier. This part of the resort has a casual feel, 74 rooms in chalet style lodges. 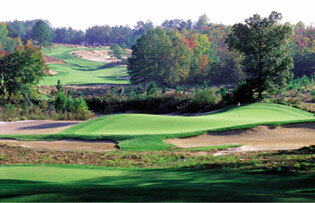 The course was renovated in 2004 in preparation for the third U.S. Women’s Open in 2007. The work was done by a Ross aficionado John Fought and he restored it back to the specifications of the original Ross design. So you are playing a true Donald Ross experience here. Play from the Ross tees, this is where the women played their championship, it is very playable but challenging as well. The course is routed through the pine trees that clearly define every hole and play into the strategy of positioning of your tee balls. The course has a good deal of up and down so you will be recalibrating irons all day. All the driving areas are generous so the big dog should eat until he is plump. It’s only shortcoming is that it’s par fives lack length, but the finesse aspect of the par fours and threes make up for this. The par fours in the middle of each nine will get your attention. Green complexes are very Ross-esque-they require sound forethought before hitting your approaches and pitches. The major design feature is that all greens are exceedingly accessible. The course is not over bunkered at all. Typical hole has two maybe three greenside bunkers but all have some direct access along the front. The greens have some of the crowning you see on #2, many pitching areas and swales off the sides and back, and a unique design feature I call “saucering”. Most of the greens have a six foot collar that surrounds the green and actually feeds balls back onto the putting surface rather than throwing them off. This is neat and presents some interesting pitching options around the greens. Women’s Open was here in 1996, 2001, and 2007-the quality of the winners lets you know how good of a track this is. Annika Sorenstam, Karrie Webb, and Cristie Kerr won here respectively. For Kerr it was probably here breakout moment as a professional-her career jumped to another level after that win. This is a top flight venue that is worth the price of admission and more. 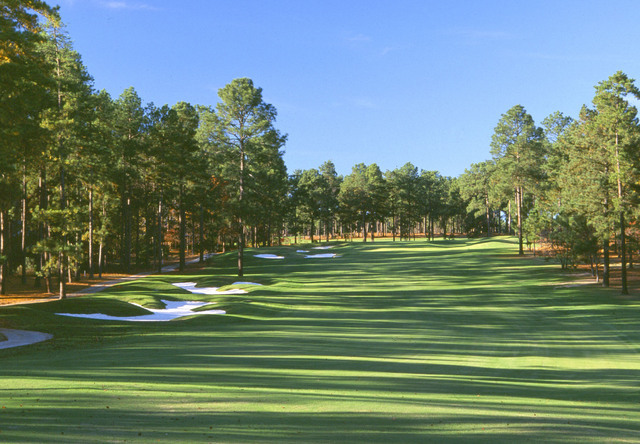 Pinehurst is one of the true meccas of golf in America and Donald Ross’s Pinehurst #2 is the signature hood mount for this place. He stands as one of the most heralded American golf course architects of his time and this course is the one all point to when they try to characterize the style of course design Ross ascribed to. Having played a number of his courses I can only agree that in this one he seemed to best orchestrate the subtle brilliance he brought to golf course design. The course is playable, challenging, and thought provoking-what more can you ask for in an afternoon’s walk. The main facility here is also a treasure-take the time to walk the hallways and peruse the memorabilia hanging throughout. 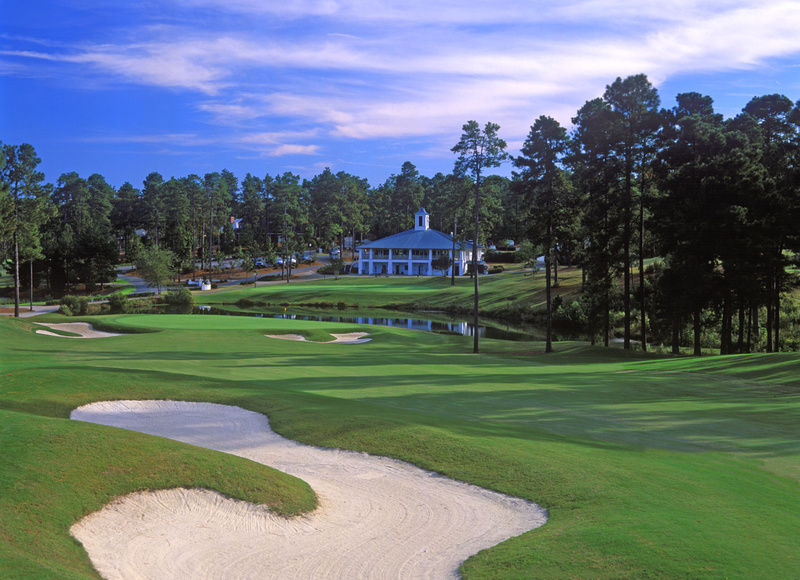 Over the last century there have been countless men’s and women’s championships played on Pinehurst #2-the North/South Amateurs, North/South Opens, PGA Championship, Ryder Cup, Tour Championship, and the U.S. Amateurs to name a few. The greatest players in play the game have won here and the plaques in the hallway outside the Donald Ross grill include names like Francis Ouimet, Walter Hagen, Ben Hogan, Sam Snead, Jack Nicklaus, Davis Love III, Curtis Strange, Glenna Collett Vare, Dorothy Campbell Hurd, Louise Suggs, Babe Zaharias, Hollis Stacy and Morgan Pressel. The course has recently hosted two men’s U.S. Open’s with great resolve-the iconic victory by Payne Stewart in 1999 and the Michael Campbell’s win in 2005-the winning scores were one under and even par respectively. 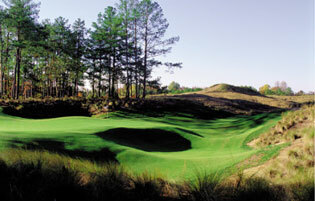 Both the men’s and women’s U.S. Open will be played on this course in 2014 in a rare major doubleheader. In preparation for that event they hired Ben Crenshaw’s design team and have spent considerable dollars bringing back the original Donald Ross character of sand and scrub rough throughout course that had been replaced by thick Bermuda rough for the previous majors. This reversion gives the course a more signature look and probably plays just as difficult for most of us. When it comes to the course itself, probably the most distinctive thing I can say is that the course is really lacks any visual distinction. Other than the crowned greens that everybody talks about, it is just another pine needle haven in the sandhills of North Carolina. There are very few holes that visually stand out-in fact, in thinking back over the round, it is often difficult to sort the holes out from one another in your mind. There is only one water hazard on the course and it is barely in play and very little out of bounds that is close to the playing area. You are likely to play the entire round with the same ball but it is likely to take plenty it’s share of verbal abuse. The brilliance of this layout is it’s stunning subtlety. It never threatens you with overt disaster but rather lulls you into submission like those Sirens whose voices seem so sweet but always lead you to dire consequences you never expected. If you do not pay attention to every detail-heed every piece of advice in the yardage book or from the caddies knowledge base you will continually pay the price and be dope slapping yourself all the way around this place. You do get the full measure of the Donald Ross formula here-once he completed the original in 1907 he spent much of the next 50 years tinkering with it so it truly represents his tactical thinking in course architecture. The driving areas adequate but not overly generous-usually flanked by fairway bunkers you want to avoid or that combination of tall pines and sand and scrub rough. Positioning off the tee is critical-on almost every hole there is a position from which playing the shot into the green is much easier. Being macho will get you nowhere out here-being tactical will derive rewards. The green complexes are what really hold people’s attention-raised turtle back greens with falloff shoulders tightly guarded by deep bunkering or grassy hollows below the putting surface. What makes this so unusual is that the green contours and shouldering really decrease the target area of the green considerably so you approach shots have to be very precise to stay on the putting surface. If you miss the green, that is when the real fun begins. One overall suggestion is leave the L-club in the trunk. Most of your affective plays around the green will be made with lower loft clubs keeping the ball close to the ground. Be open minded to the shots you hit around the greens because you will be amazed how creative thinking can get you much better results than the obvious one third in the air-two thirds on the ground formula. It will take a few holes to get used to this approach but by the middle of the round you should get it and you will find your percentages of up and downs improve as a result. When you get back home and pull off one of these shots in front of friends you can brag that it was just a piece of memorabilia you brought back from Pinehurst #2. This is a course that must be walked to be totally appreciated-plus the caddie’s insight will make the course much more playable. It is well worth the premium to take this one in on the ground. 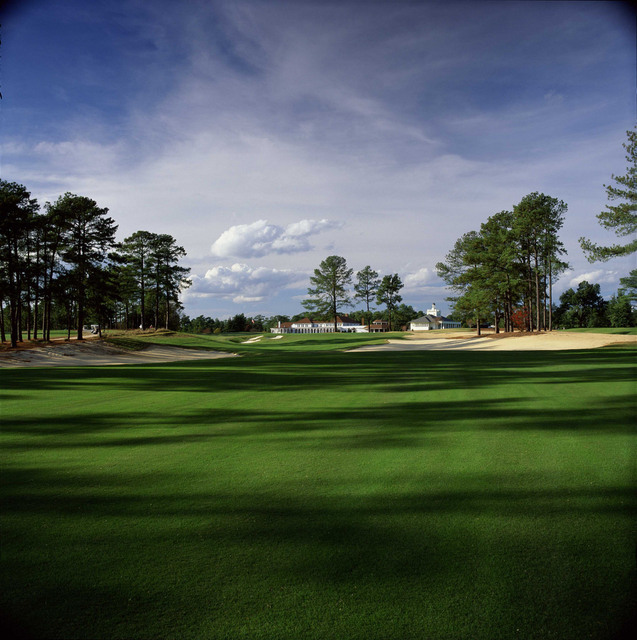 Once you have played this you may not remember the details of the holes but you will never forget the Pinehurst #2 experience. Once Donald Ross gets into you head and he never leaves. In 2000 Tom Fazio finished the replacement of Donald Ross’s original #4 course with a totally new course on the site of the old #4 design. This “tribute to Pinehurst” has all of the traditional look that people have come to expect in the sandhills of Pinehurst, strategic hole designs, crowned greens, bold contouring, and about 180 silver dollar pot bunkers littered about. 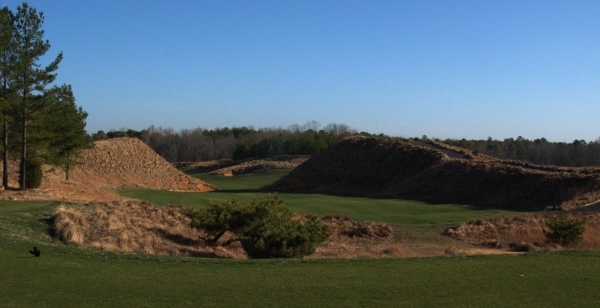 This new course stands tall next to #2, #8, and #7 as another of the many seminal golf challenges this resort provides. The course is built on the ground adjacent to #2 so it shares some of the feel of it’s favored sister, but the ground has much more topographical interest which gave Fazio lots of latitude to create stunningly visual holes with unique strategic character. Many of the green settings have the fall off shoulders or steep fronts but they do not really have the turtle back appearance Ross used on #2. Fazio’s liberal use of small pot bunkers-especially around the greens-gives a real Scottish arbitrariness to the design that is visually delightful and strategically challenging. He also used the large shouldering sand waste areas to delineate many of the holes giving the intimidating pine barren look to many of the driving areas. The routing of the holes are defined by the trees and the waste areas-similar to what he did on #8-so there is a premium for driving accuracy to set up aggressive plays into the greens. What I like more than anything here is the variety of the holes and the sequence of the challenges. Both sides of the course start slowly but by the time you get to the third hole the difficulty factor is ramping up quickly. You see holes that turn both ways, holes that go up, holes that go down, small greens, big greens, the whole mishpucha-but more than anything you will see one uniquely different hole after another that will demand you pause for thoughtful planning on the tee before taking on the challenge before you. To score well here you need to be tactically correct, have great execution of your intent, and a little bit of luck would not hurt either. There will be some blow up holes so being reasonably aggressive throughout makes the most sense. 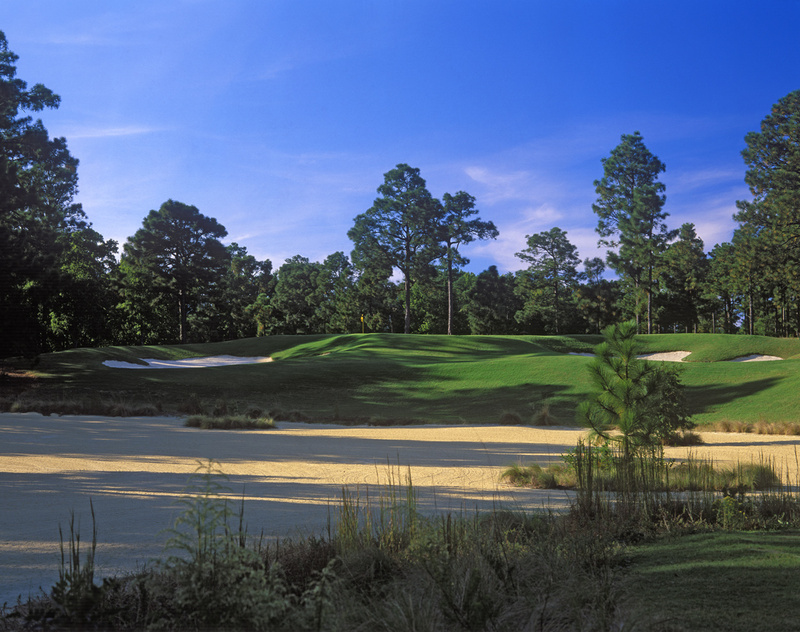 Rees Jones added another classic Carolina through the pines course to the Pinehurst family on one of the most rugged pieces of land on the property. The course has an almost mountainous feel to it with many holes playing down off the tee to a landing area and up to the green on the approach. The hilly terrain makes the yardage on the scorecard deceiving since many holes play a club and a half more up to the greens. At a slope of 140 from 6800 yards it is in my estimation the hardest of the numbered courses here at the Mecca of American golf-just seems like avoiding the high score on individual holes is very difficult. Many huge pines that seem to attract any wayward shot-anything off the fairway seems to find the trees and there are few par saves available from the needles. Therefore, it is a very exacting driving course-first four holes in particular are very tight. Knowing the Carolina pine needle shot is very important-use the fairway bunker swing-little leg motion-contact ball before needles. Driving in play and good putting are integral to a decent score. The place is not over-bunkered, the trees present plenty of hazard on their own, but the bunkers there are have exotic shapes and sizes designed to visually intimidate. The greens are large, influenced by grain, rolling, and segmented with lots of slant in them. There is a big premium for keeping your approach shots below the hole. Most of the greens are set up on hills or plateaus so you have many high soft shots to stay on the putting surfaces. Nature note-they have a special breed of fox squirrels here-looks like Zorro and eats anything. Plenty of playground room for them. There was quite a bit of anticipation when Fazio, a North Carolina favorite son, got the nod to build his first course in Pinehurst to honor the Centennial Celebration of this golfing mecca. The course he designed easily met all those expectations. 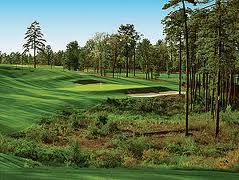 It is a spectacular but playable course meandering up and down through the tall pine trees and fresh water marshes. The course is panoramic-many sweeping downhill holes where you can clearly see all the challenges in front of you. Big segmented greens with good speed and breaks that will challenge your judgment as well as your execution. This is a thinking man’s golf course-approaching each hole with the right forethought can make a big difference on the scorecard. Bunkering is plentiful but it is not overdone. Most greens are accessible from one angle on the front-so pay attention to position your ball properly for the most advantageous approach. The landing areas are always more generous than they appear-he often uses the change in elevation to mask the landing areas from view but if you look carefully at the yardage book you will see that he gives you plenty of room to play to. The greens have significant slope-many fall off to one side or the other. The shots into the greens need to take this into account to get your ball close enough for birdie opportunities. The course starts out kindly enough with a sweeping downhill dogleg left that reminds me of the first at Spyglass Hill. The pace remains tepid for the next few holes until you reach the fourth which is a massive dogleg left par four which will change your mindset for the day. What follows the rest of the front side are a series of very technical holes that demand you control your roll out to avoid the adjacent trouble. The ninth is the angry sister of the fourth which it parallels in the opposite direction-big dogleg right with an uphill approach into a difficult green. The back side starts quietly but from 11 through 13 you play a series of very difficult holes in an area where they turned a sand pit into a visually intimidating series of hazards. From here in the challenge rachets up considerably. The fourteenth is your classic warf style hole with water from tee to green on the left and a putting surface that seems to be hanging precariously above the water. 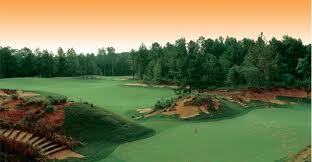 The last three holes work up and down the hillside that leads to the clubhouse. In all cases you are tempted to hit it farther than you need to-like the ending of the front side it is all about controlling your ball flight and positioning. The finishing hole brings you up the hill to rediscover the view of the clubhouse perched atop the hill. The cool one that is waiting for you in the bar will be eagerly anticipated. He designed this to be a walking course-the greens and tees are in close proximity. Make sure you arrange for a caddie ahead of time-the experience is enhanced considerably taking this one in from ground level with some local advice.